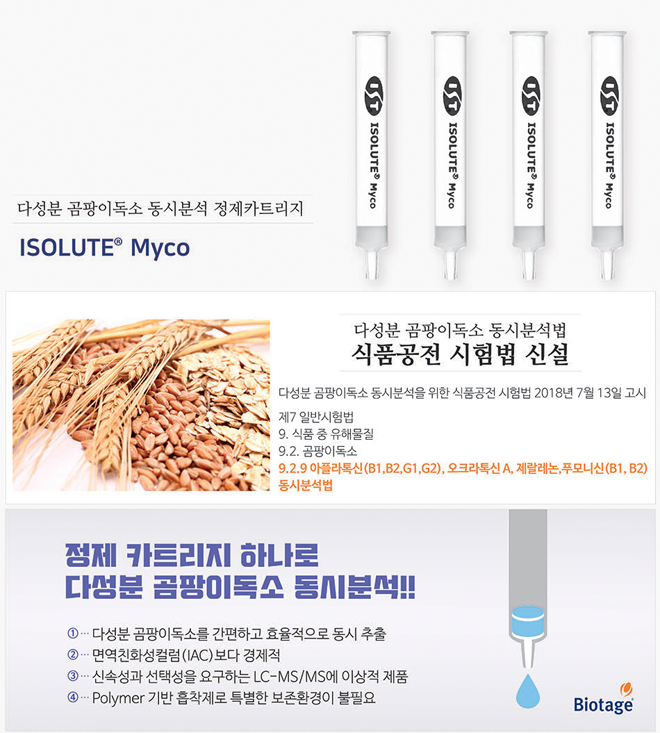 ISOLUTE® Myco SPE columns offer simple and efficient multiple mycotoxin sample preparation from a wide range of matrices, ideally suited for selective and fast LC-MS/MS analysis. ISOLUTE Myco SPE columns contain a novel polymer-based sorbent(Patent pending) designed specifically to be selective enough to isolate a wide variety of different mycotoxins. One product with multiple applications, simplifying and streamlining your mycotoxin analysis procedures. SOLUTE Myco clean up methods are quick, simple to use and require no offline steps; making the technique suitable for automation, especially useful for high throughput testing laboratories. Unlike immunoaffinity columns, ISOLUTE Myco columns are cost effective, easy to use and have no special storage requirements. aflatoxin B1, aflatoxin B2, aflatoxin G1, aflatoxin G2, ochratoxin A, fumonisin B1, T-2 toxin, HT-2 toxin, zearalenone, deoxynivalenol, ergocornine, a-ergocryptine, patulin. grain (wheat flour, wheat, maize, barley), apple juice, nuts (Brazil nuts), spice (chili). Infant Formula (Cereal) aflatoxin B1, aflatoxin B2, aflatoxin G1, aflatoxin G2, ochratoxin A, fumonisin B1, zearalenone, HT-2 mycotoxin, T-2 mycotoxin. * Applications have been developed using representative analytes from multiple mycotoxin classes, as shown, and may be extended to include other analytes with similar chemical and structural characteristics as required. * COMMISSION REGULATION (EC) 401/2006 (ii) (laying down the methods of sampling and analysis for the official control of the levels of mycotoxins in foodstuffs). Solid phase extraction is a simple and effective technique used in the extraction of small molecules from complex matrices. Solid food samples are first treated (usually by grinding or homogenization and solvent extraction) to ensure the mycotoxins of interest are freely available in the liquid phase (step 1, below). 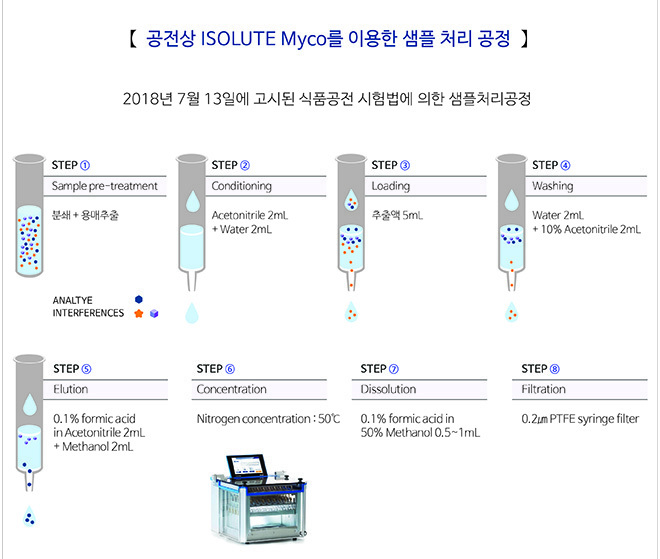 The ISOLUTE Myco SPE column is prepared for extraction (steps 2 and 3), and the sample is applied. As the liquid sample passes through the SPE column (step 4) mycotoxins are extracted from the sample and adsorbed onto the ISOLUTE Myco sorbent. Unwanted matrix components are then selectively removed from the column using optimized washing procedures (step 5), before the mycotoxins are selectively recovered from the columns using an elution solvent (step 6) resulting in a highly purified extract for analysis. This ‘catch and release’ procedure using ISOLUTE Myco SPE columns allows the clean-up of a wider range of mycotoxins from different matrices compared with ‘interference removal only’ approaches. 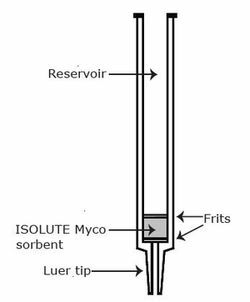 The ISOLUTE Myco SPE column consists of a tabless cartridge containing 60 mg of mycotoxin specific polymeric sorbent sandwiched between two frits and a standard luer tip for ease of use (see Figure 2). Once conditioned, sample is simply added into the reservoir and allowed to flow through the ISOLUTE Myco sorbent. Mycotoxins are retained on the sorbent, and through a series of simple washes and drying steps any matrix interferences are removed. The mycotoxins are then eluted from the column, for analysis by LC-MS/MS. The ISOLUTE Myco format is compatible with most standard SPE processing equipment, including vacuum and positive pressure manifolds, and automated systems that hold the standard 3 mL column size.